This was a challenge it self, the cake board has holes drilled in it, and then I covered it in brown icing for the hat base. The strings of corks were made from edible laces and sprayed gold. 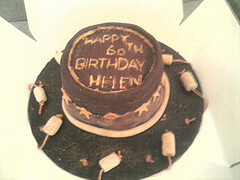 The corks were made from white and brown icing. I then made 3 layers of cake, 2 sponge and one chocolate covered in buttercream icing. I then made the hat itself from chocolate icing and molded it into a hat shape. I also made a chocolate mold for the kangaroo at the front of the hat. Finally I made the scarf around the hat from icing and made a tie at the back.